Dr. Stuart Smith is a Professor of Mechanical Engineering in the Center for Precision Metrology at UNC Charlotte. Throughout his research career his main focus has been the development of instrumentation and (electrical, optical and x-ray) sensor technologies, including advanced signal processing techniques, for measurement of surface profile, micro-geometry and displacements, primarily aimed towards the challenges of atomic scale discrimination, sensing, and surface modification. Dr. Stuart Smith is a Professor of Mechanical Engineering in the Center for Precision Metrology at UNC Charlotte and was cofounder of North Carolina companies Albany Instruments Inc., 2000, Motus Mechanical Inc., 2014 (now Motus Dynamics Inc., 2016) and was involved in the origination of InsituTec Inc. in 2002. These research and manufacturing companies specialize in eddy current sensing technologies, mechanism construction kits and fine motion control metrology systems respectively. He started his career in 1977 when he took up a factory maintenance apprenticeship with Miles Redfern Ltd (UK), a manufacturing industry producing rubber and plastic components for the auto industry. After completing his Ph.D. degree at the University of Warwick he continued working as a faculty member at this institute for 6 years. In 1991 he was awarded an engineering secondment by the Royal Academy of Engineering and subsequently spent a year on sabbatical leave working at the Center for Precision Metrology at the University of North Carolina at Charlotte. In 1992, he returned to Charlotte to take up a permanent position. Throughout his research career his main focus has been the development of instrumentation and sensor technologies, including advanced signal processing techniques, for measurement of surface profile, micro-geometry and displacements, primarily aimed towards the challenges of atomic scale discrimination and modifications. Development of these systems has required the innovation of many high bandwidth, precision positioning and translation systems. 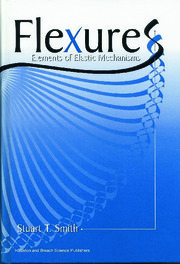 This work has resulted in 18 patents, over 90 journal publications, 90 conference proceedings and the authorship of two books (Flexures: Elements of elastic mechanism design and Foundations of UltraPrecision Mechanism Design) the first of which remains in print after 25 years. Current interests include the integration of multi-sensing methods into precision electromechanical systems for nanometer and micrometer level assembly, x-ray interferometry and micro CT metrology, dimensional metrology, and the creation of new instrumentation capabilities. This work was recognized with a lifetime achievement award from the American Society for Precision Engineering is 2016. Precision machine and instrument design.